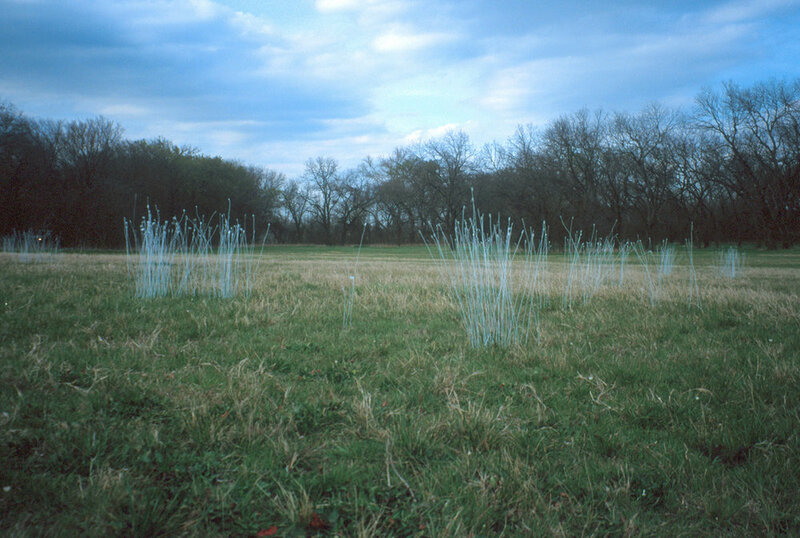 Dimensions: variable, each unit consists of 30-60 individual wires, 18-36"
Reflecting Tips started as a temporary installation in 1999 at the Connemara Conservancy located in Dallas, TX. 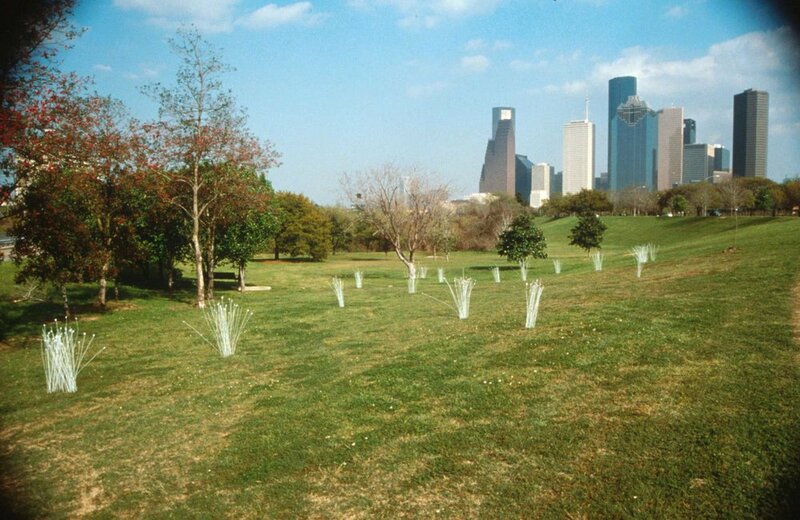 It was expanded in 2001 and exhibited at Diverse Works at the Buffalo Bayou Park in Houston, TX. 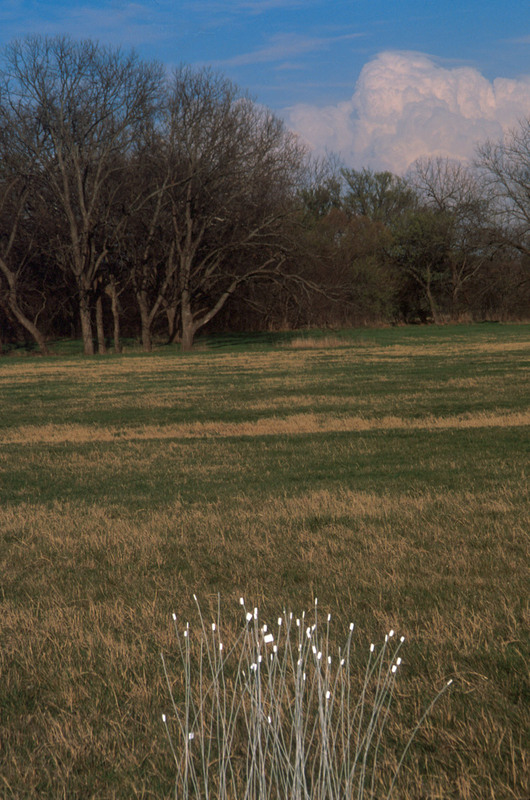 In 2001, Yahoo! 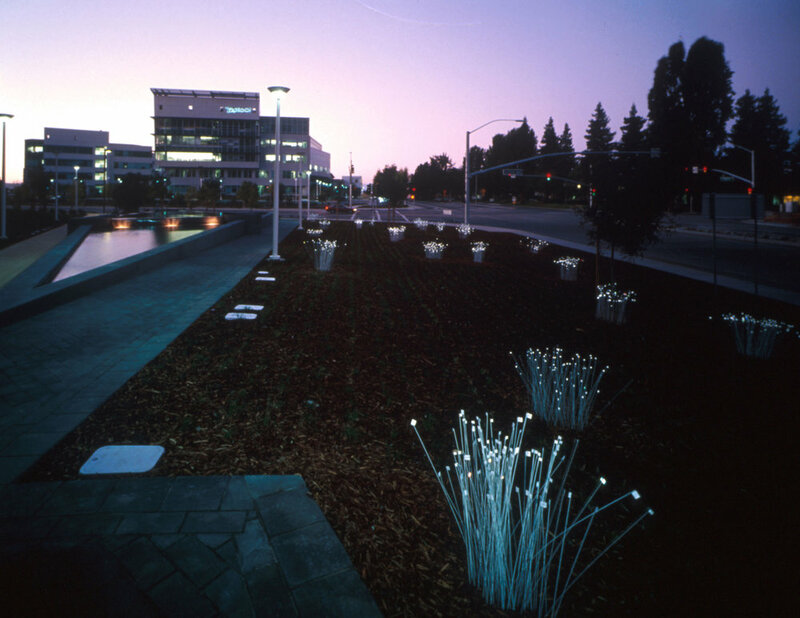 commissioned Louden Studio to build a permanent site-specific installation at their corporate headquarters in Sunnyvale, CA, where it was later re-configured in 2008. 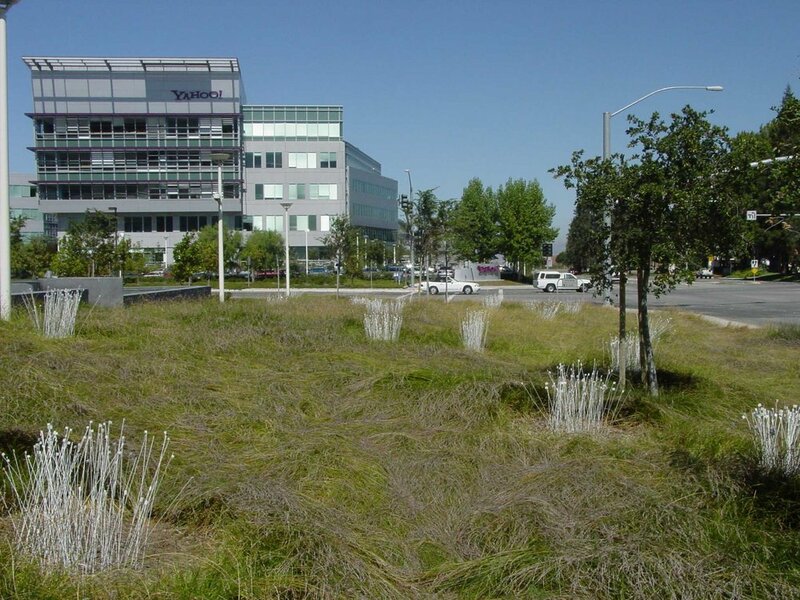 Spanning a 10,000 square foot outdoor space on a public street corner, Reflecting Tips at Yahoo! 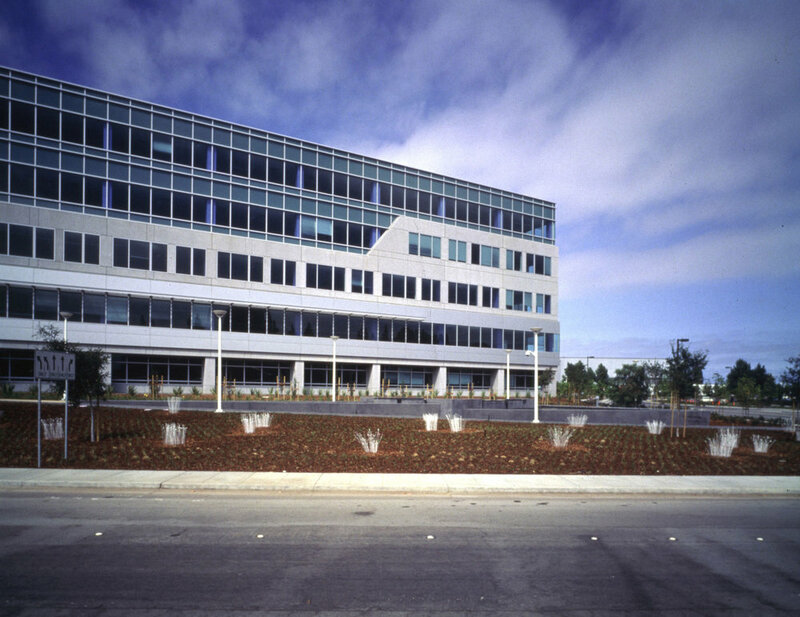 's corporate headquarters is a low-tech piece that has high-tech surprises. 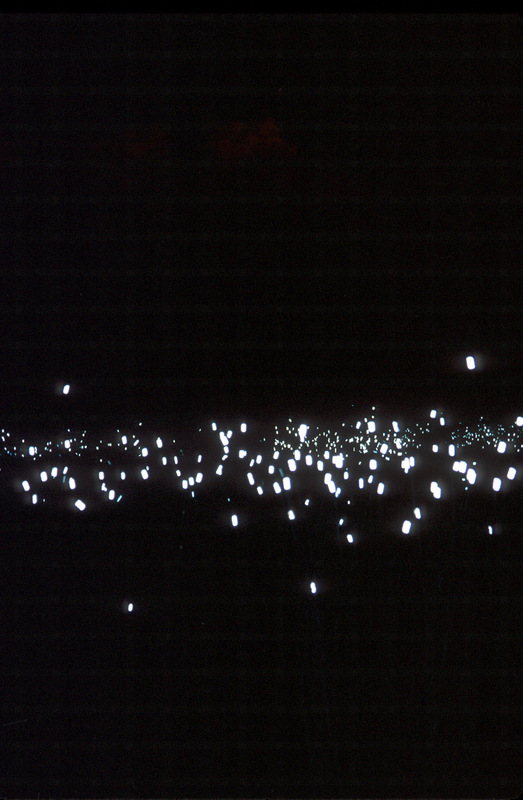 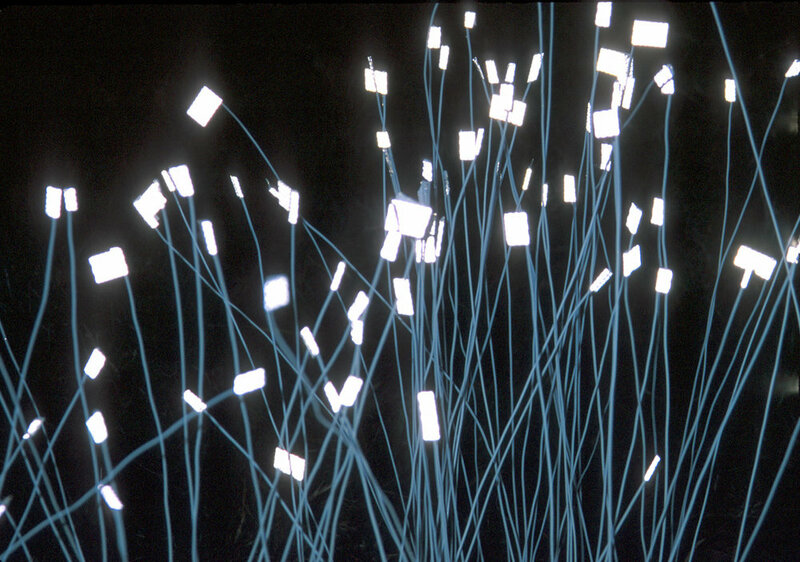 Consisting of over 6,000 individual pieces grouped into 22 separate units, the sculpture uses man-made objects of simple, thin, white powder-coated steel wires with small, medium, and large-sized high-intensity reflective sheeting that is attached onto steel plates with epoxy and welded to the tops of the wires. 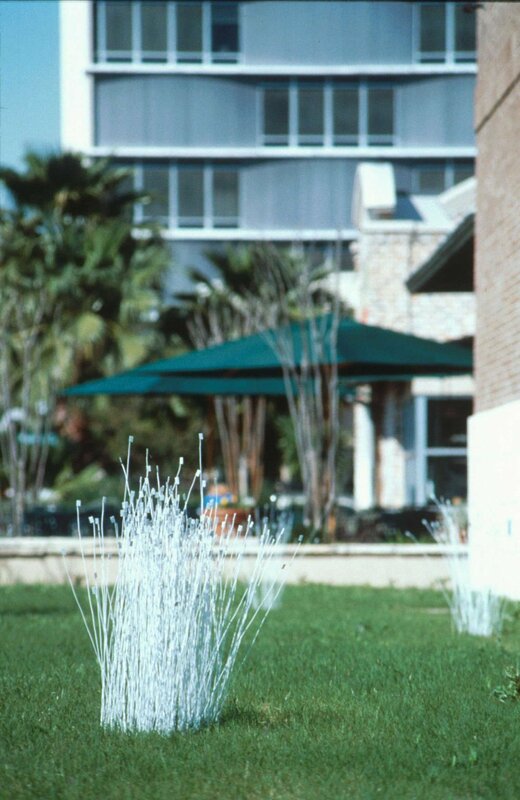 The reflective sheeting casts light back to the viewer with an 800 candle-power intensity, and the wires sparkle during the day with the colors of the rainbow, lighting up as cars pass by at night. 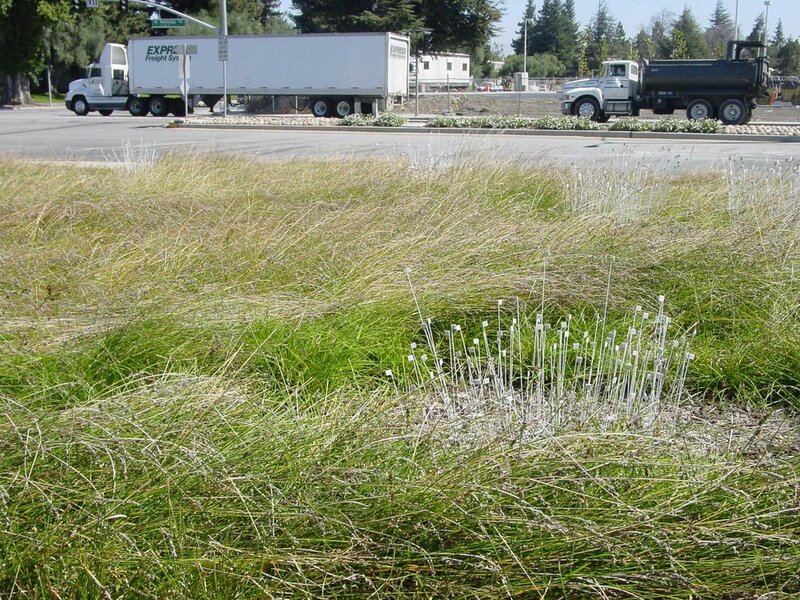 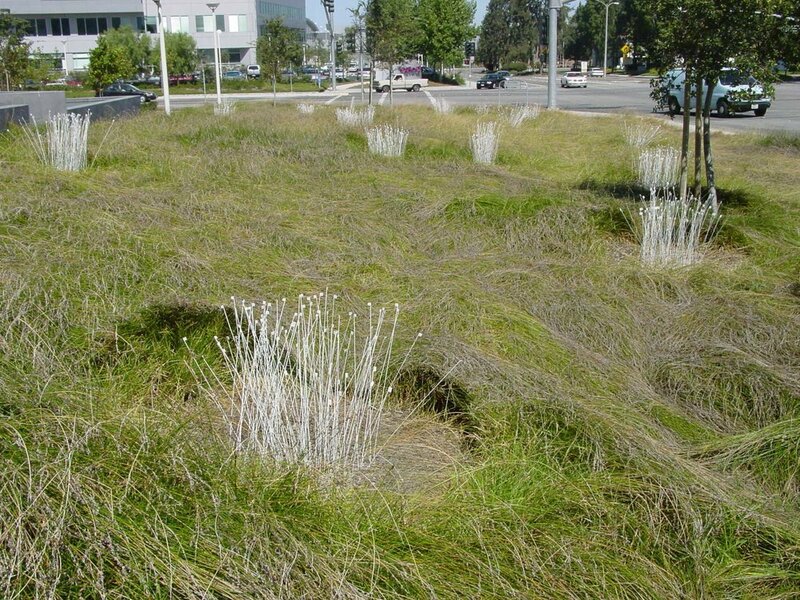 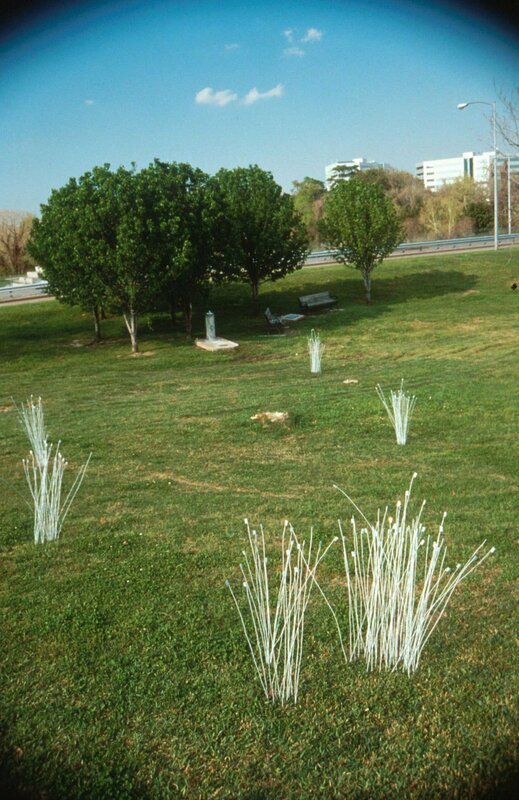 Meant to contribute and add to the natural beauty of the landscaped grasses, Reflecting Tips is not the usual public art piece. 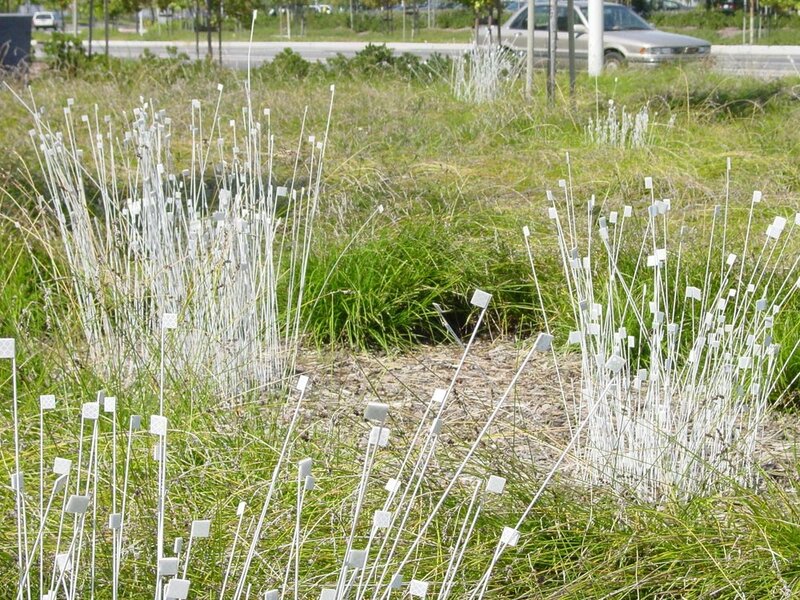 This very modest installation is down-to-earth, appearing as if it's part of nature even as it's clearly not from nature. 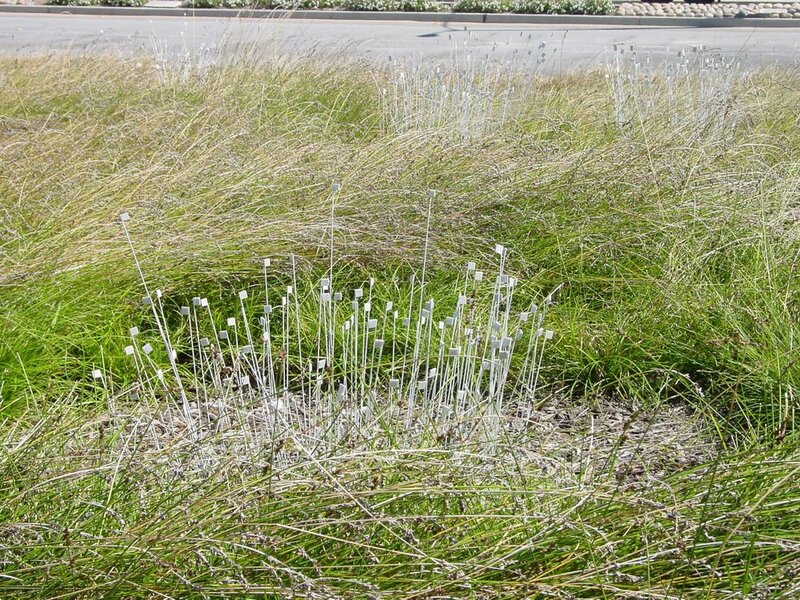 It's whimsical yet inviting to passer-bys who may stop for a respite on the available benches. 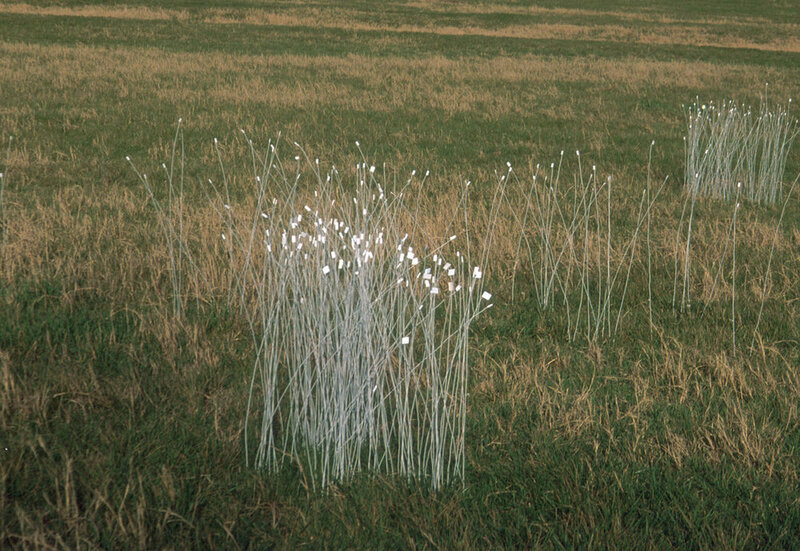 "Reflecting Tips" was originally created during a residency at the Connemara Conservancy in a 5,000 square foot meadow.